On Wednesday night the many admirers of one of the all-time great road ponies had one last chance to see The Cajun Cat and bid him farewell from the show ring. However, “the Cat” is not going to disappear from the public eye. A sociable pony who truly loves his human friends, the Cat is moving into a second career – serving as an ambassador for the Hackney pony breed and for a North Carolina therapeutic riding program. 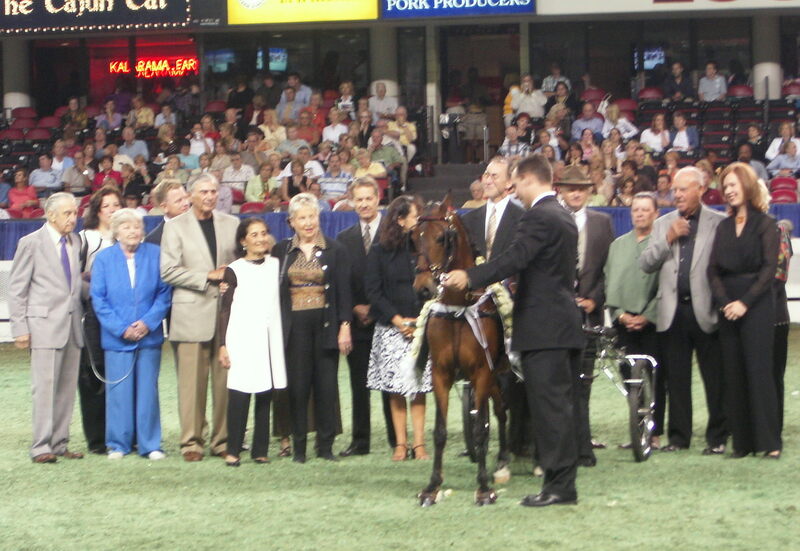 Charging into the ring to the driving music of “Don’t Stop Me Now” by Queen, Morgan Wolin and her beloved The Cajun Cat were joined in center ring by those who played an important role in the Cat’s life and show ring career. Ladies and gentlemen, tonight we have a very special retirement. We will be welcoming the 13 times World’s Grand and Reserve Grand Champion The Cajun Cat to Freedom Hall. It is only fitting that The Cajun Cat marks the end of his competitive career here, the place he has called home for most of his twenty years. The Cajun Cat has raced to an unprecedented number of world champion victories spanning three decades in both the open and amateur divisions. The Cajun Cat, originally known as Glory Boy, was bred and first trained by the George Smith family at County Line Stables. The Smith family started his march towards world championship titles. Dr. Alan Raun and Farris Craig quickly purchased him; they saw the potential in this very young pony. They continued the Cat’s triumphs at Freedom Hall. Sally Parker couldn’t resist the incredible spirit and heart this determined pony exhibited when she saw him the first time. She purchased him despite knowing she never had plans of driving him. Anne and Sam Stafford of Cleveland, Tennessee took care of that problem. Sam Stafford became a fixture on the lines of The Cajun Cat and led him to all of his World’s Grand Championships in the open division. During the past 15 years, The Cajun Cat has won the open and amateur championships at every prestigious show in the country including Lexington Jr. League, American Royal, Bonnie Blue, Asheville Lions Club, Southeastern, All American Classic, J.D. Massey, Madison Charity, and Midwest. 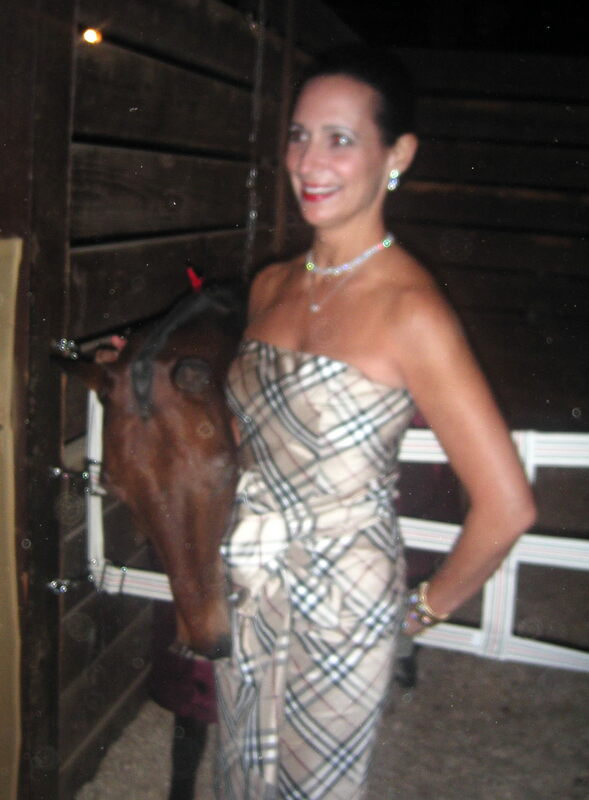 He has also been voted Roadster Pony of the Year multiple times by the United Professional Horsemen’s Association. The Cajun Cat has been an incredible ambassador to the Hackney breed by performing at the Walking Horse Celebration, as well as being on national TV twice. But The Cajun Cat will continue to be much more than a show pony. His retirement years will not be those of leisure. He has been chosen to serve as ambassador to the Mitey Riders Therapeutic riding program. He will also serve as mascot to the Krussell Youth Group and has been asked to perform in the Marshall Fields Thanksgiving Day Parade in Chicago. Please welcome to the ring The Cajun Cat, his beloved owner Dr. Morgan Wolin, and his trainer Ray Krussell from Chicago, Illinois. Joining us in the center of the ring are several people who have been an integral part of the life and career of this remarkable pony. Morgan’s husband, Dr. Preston Wolin, Morgan’s mother and sister who have been riding with Morgan her entire life, trainer Ray Krussell, Wendy Carney, Dr. Alan Raun, the George Smith family, Anne and Sam Stafford, Julia and Steve Joyce, along with the Cat’s favorite caretaker, Pedro Martinez. Unfortunately, the Cat’s most ardent admirer, Sally Parker, couldn’t make it tonight from her home in Maryland. Also, we have some very special guests tonight – Marilyn and Harry Swimmer, founders of the Mitey Riders Therapeutic Riding Program in Weddington, North Carolina. Morgan said the most amazing part of owning The Cajun Cat wasn’t the blue ribbons, but the joy and smiles he always puts on children’s faces whether they’re playing with him or riding him. The Cajun Cat hopes to help raise awareness and money for the Mitey Riders as well as North American Therapeutic Riding Programs. Now as he parades one more time with the floral garland as he has done so many times before, he salutes his new friends who are the MITEY RIDERS, true-life champions. As the Mitey Riders say, “WE CAN’T WALK BUT WE CAN TROT!” and CAJUN CAT CAN CERTAINLY DO THAT TOO!!!! Because he can’t be stopped now.